Hopefully she will bring a smile to the face of a child who has been affected by the devastating wildfires. Interested in helping out? Check out Craft Hope's Project 15. I followed this tutorial to make my monkey. I saw something about this but forgot all about it! I would love to contribute! Thanks for the info! 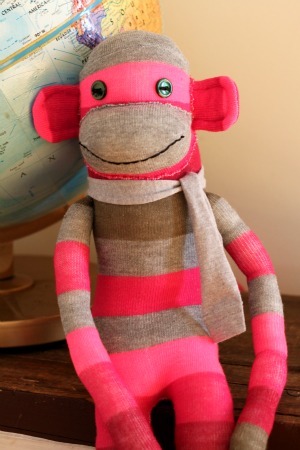 Your monkey is adorable, love the color choices! 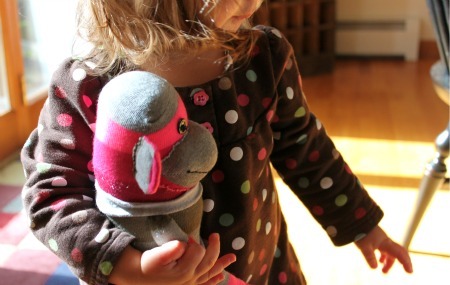 Such a cute monkey- I know a child will love her. Very kind of you. Darling, Gwen. I love the socks you chose! I think that's the cutest sock monkey I've ever seen. Love the pink striped socks! So sweet. I love that you do these great projects to give back to those in need. This monkey will certainly make a child extremely happy. How could it not? 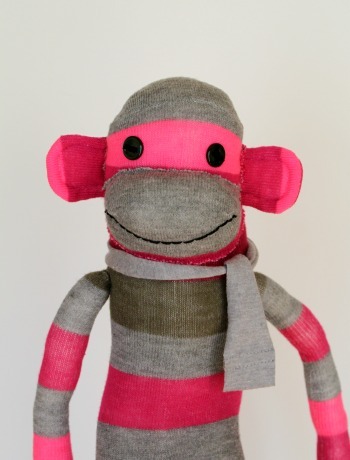 I think it is the most adorable sock monkey that I have ever seen! How beautiful that you made it for a stranger in need! What a cute little monkey! I really need to get on the ball and make a monkey or two. Thanks for the reminder! Absolutely adorable! such a beautiful post. I'm so glad you posted about this! My daughter and I are going to make up a few of them. I think it will be a wonderful way to teach her how to sew! I love the monkey you made and that you let the raw edges show. I love the look it gives!